THE MISSION is pleased to announce End of Daylight, an exhibition of painting and sculpture by Chilean artist Rodrigo Zamora. An opening reception will be held on Friday, June 23 from 6:00 to 8:00pm. The exhibition will be on view through Saturday, August 5, 2017. In his exhibition End of Daylight, Zamora presents paintings that transform objects into amorphous anatomies, challenging memory and perception, specifically within the context of our relationship to our urban surroundings. As a pedestrian, Zamora takes photographs of neglected weeds, littered refuse, cloudy waterways, and tangles of cables. The subject matter often unnoticed and considered unwanted within our metropolitan scenery is given vitality in his exhibition. In Zamora’s Absence of Sound series, he strips away the object’s context leaving unkempt, overgrown weeds situated within a conglomeration of adhered squares. Either by hand or on the computer, Zamora creates a sketch, segments the sketch into a grid, reproduces each section onto an enlarged square of paper or canvas, and assembles the puzzle of individual pieces to create his enlarged, abstracted paintings. 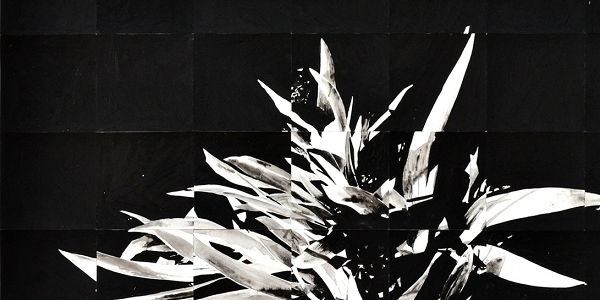 Upon close inspection, varied tones and intensity of India ink misalign with neighboring squares. Similar to the way David Hockney’s “joiners” excite the movement of the composition with a patchwork of photographs taken from multiple perspectives, Zamora’s slightly broken composite paintings also have an affinity toward Cubism’s multiplicity of viewpoints. In tandem with his painting practice, Zamora periodically constructs small- to large-scale sculptures. Attracted to a repetitious geometric formality, Zamora relies on the grid to structure the assembly of his work. Rather than alluding to volume through the application of multiple perspectives as he does in his paintings, Zamora extends his abstraction to three-dimensions in Atrapar el Tiempo. His simplified sketches of objects found on the streets—frequently from those used in his paintings—guide Zamora’s repetitious geometric wood forms that suspend off the wall in various directions, sizes, and perspectives. RODRIGO ZAMORA (b. 1970, Santiago, Chile) received a BFA from the Universidad de Chile in Santiago, Chile. He recently exhibited solo exhibitions at Galería Patricia Ready (Santiago, Chile), Galería Emma Thomas (Sao Paulo, Brazil), and Galería Casa Cuadrada (Bogotá, Colombia). He has been included in group exhibitions at Galería Sol del Río (Ciudad de Gautemala, Guatemala), Sala de Arts CCU (Santiago, Chile), Hangar Nekoe (Santiago, Chile), and Casa Nekoe (Valparaiso, Chile). He has received grants from FONDART, Chile’s Art and Culture Council in 2007, 2008, and 2011. Zamora lives and works in Santiago, Chile.